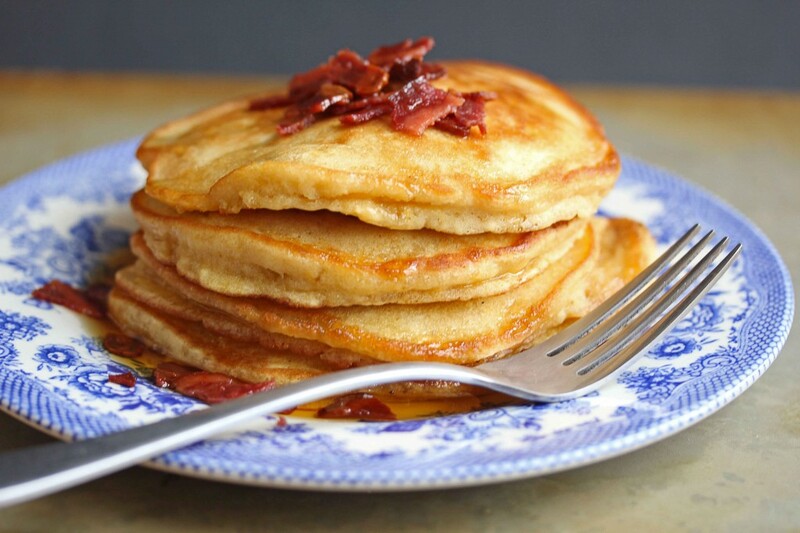 Brown Sugar Pancakes with Bacon Butter is where Happiness resides. Let me tell you why that is. These are just so easy to make and so darn delicious that after putting forth minimal effort and getting fine dining quality, happiness will inevitably consume you. Well that was my experience anyway. I have long been the biggest fan of pancakes. I feel bad for my husband that has had to appease a random craving in the middle of the night by loading us in the car to find the nearest IHOP or diner. The thing is I just adore simple pancakes. 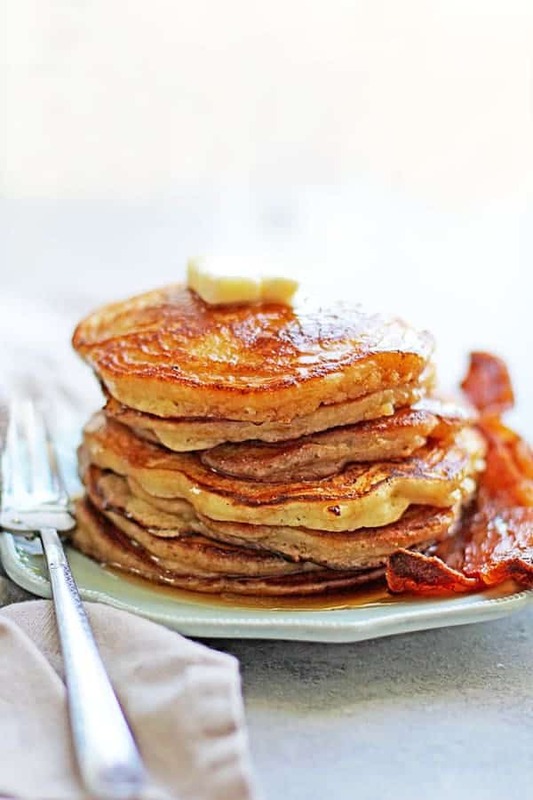 Simple, hot off the griddle, fluffy, crispy-edged, buttermilk pancakes will do me just fine. And don’t forget the butter and warm syrup and I’m set. I really don’t feel the need to guzzy them up because the simplicity of the meal is what makes me so darn warm and fuzzy. I tell ya, it’s the little things in life that count. 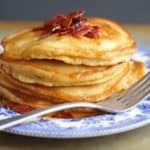 This brown sugar pancakes recipe fits right in line with my “simple is best” philosophy but it gives it a little edge. The brown sugar in subtle yet rich. You can definitely taste the deeper flavor the molasses lend. The texture is still light and fluffy, and if you are like me, you love a nice golden crispy edge to your hot cakes! And for a little fun, I baked some bacon, cut the strips into tiny pieces and mixed the bits with a warm butter syrup. I never need another pancake again. Perfect pancakes are my jam! These lemon ricotta pancakes or this easy blueberry pancakes recipe are incredible! 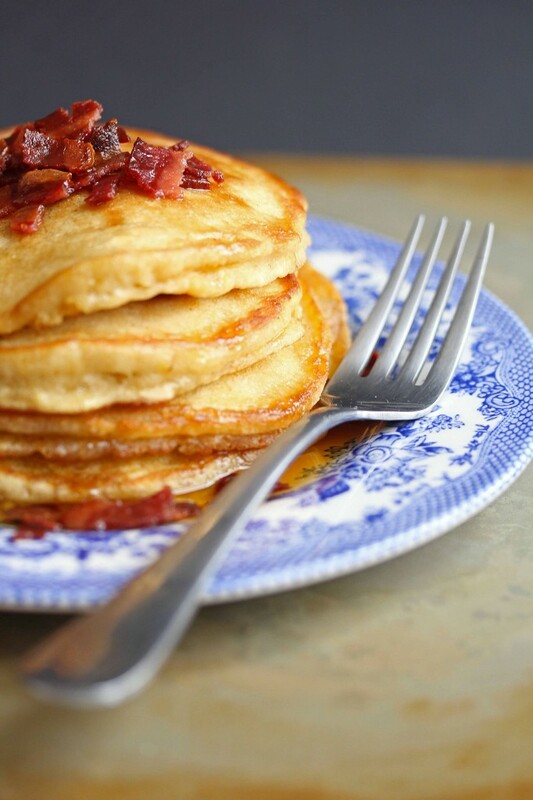 and this Perfect Classic Pancakes recipe is wow! Whisk together flour, baking powder, and brown sugar into a large bowl. In another bowl, whisk together eggs, sour cream or greek yogurt, milk, melted butter, and vanilla extract until combined. Slowly whisk the wet mixture into the dry mixture just until combined. The resulting should be slightly lumpy yet still combined so don’t overmix. Leave the lumps there. No need for a smooth batter. Pour about 1/4 of a cup of batter onto the griddle surface in a circular pattern and allow to sit until bubbles form and the bottom is golden brown and crisp. Flip over the pancake and cook until golden brown and crisp on the other side. Add butter and maple syrup to a microwave safe container and melt together. Add some of the bacon bits to the syrup and leave the rest for garnish. 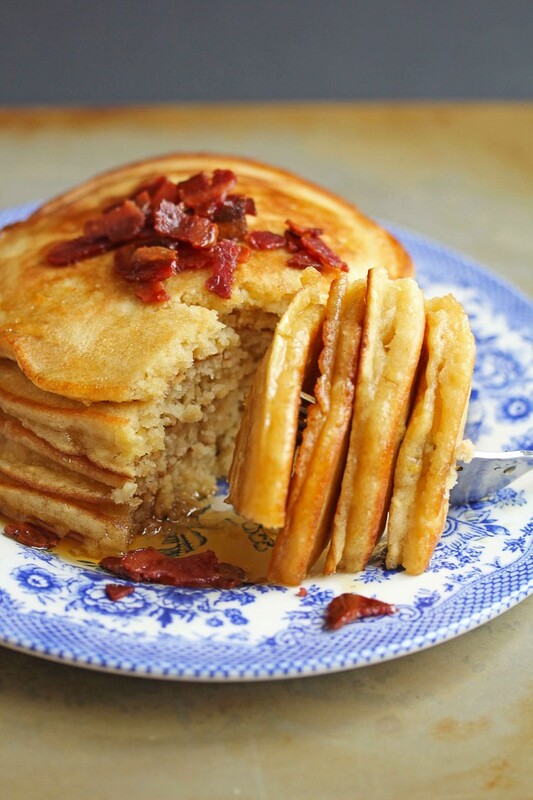 Add pancakes to your plate and add bacon bits to the top pancake in your stack. Pour syrup mixture over pancakes and enjoy. Fantastic! I’m so glad you enjoyed them. This recipe was fantastic! Thanks for sharing!! Did the buttermilk get swapped out with yogurt/sour cream? Made these before and making these this weekend and just wanted to make sure I wasn’t imagining things. I love this recipe! I have been doing it for a while now but I remember using buttermilk and not Greek yogurt or sour cream. Did you change it? The perfect snow-day treat! Thanks for a great recipe! I followed this recipe exactly… My pancakes don’t look anywhere near as good as those in your picture. Mine are just utterly unremarkable looking, and tasting. They’re just normal pancakes. Sorry Rebecca yours didn’t turn out like mine. I have made this recipe more than a few times so I’m not sure why yours didn’t come out more like mine, and I wouldn’t know unless I saw a picture. Hopefully you will try them again and they turn out better in the future. Feel free to email me if you want to chat more about your pancakes. I have no words for this recipe … just <3. As soon as I am back from vacation, I am whipping up a batch of these bad boys. TOO GOOD!